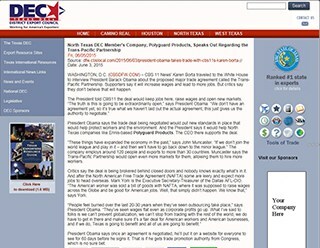 WASHINGTON, D.C. (CBSDFW.COM) – CBS 11 News’ Karen Borta traveled to the White House to interview President Barack Obama about the proposed major trade agreement called the Trans-Pacific Partnership. Supporters say it will increase wages and lead to more jobs. But critics say they don’t believe that will happen.